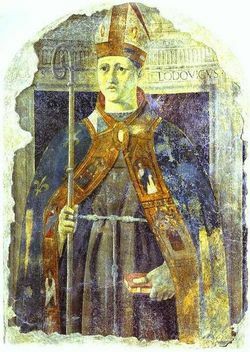 St Louis was born into royalty at Brignoles, France. When his father, Charles of Anjou, was taken prisoner during the war with King Peter, St Louis and his two brothers were used as hostages to secure his freedom. As part of the agreement, St Louis and his brothers were placed under the care of the Franciscans for seven years. When St Louis’ older brother died in 1295, St Louis became heir to his father’s inheritance but he soon gave it all up and went to Rome, announcing that he would take the Franciscan vows of poverty, chastity and obedience. That same year and following his uncle’s death, he was made Bishop of Toulouse but again, he gave it up, preferring to serve the poor and hungry to the detriment of his own needs and health. At 23, he died from a fever, possibly typhoid. St Louis’ Feast Day is the 19th August. He is Patron Saint of Valencia. Pray for us that we will strive to help the poor and marginalised in our society.